Capital Community dedicated three months to series on Faith, Hope and Love. 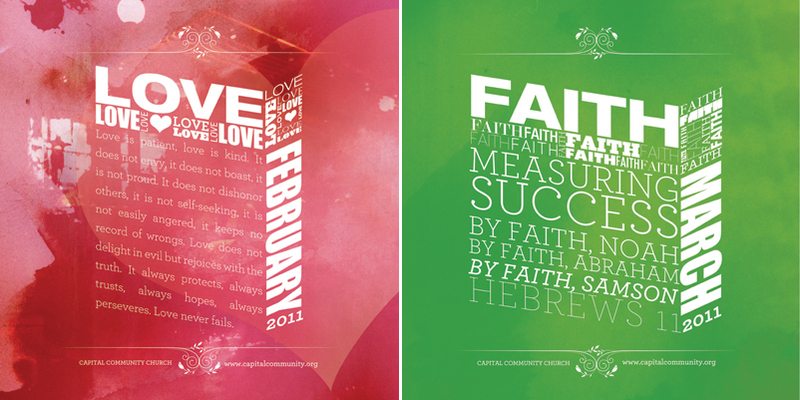 They started with “Love” in February, they did “Faith” in March, and finished with “Hope” in April. These two square posters corresponded and then we did a different approach for “Hope” and Easter. If you would like to chat about custom graphics for your next sermon series, simply click on the “contact” tab above and shoot me an email! I am studying photography and spend almost all of my time researching, learning, exploring, photographing and all the many wonderful creative things that go along with being a passionate and creative individual. I was really impressed by your website/blog…I love your experiments with texture. I love to do the same. I love to experiment and break the rules and cross barriers along the way. You seem like an incredible photographer and person. I just wanted to say hello and let you know I really admire your work and commitment to family and your craft. You really stand out in a crowd on the gigantic web. 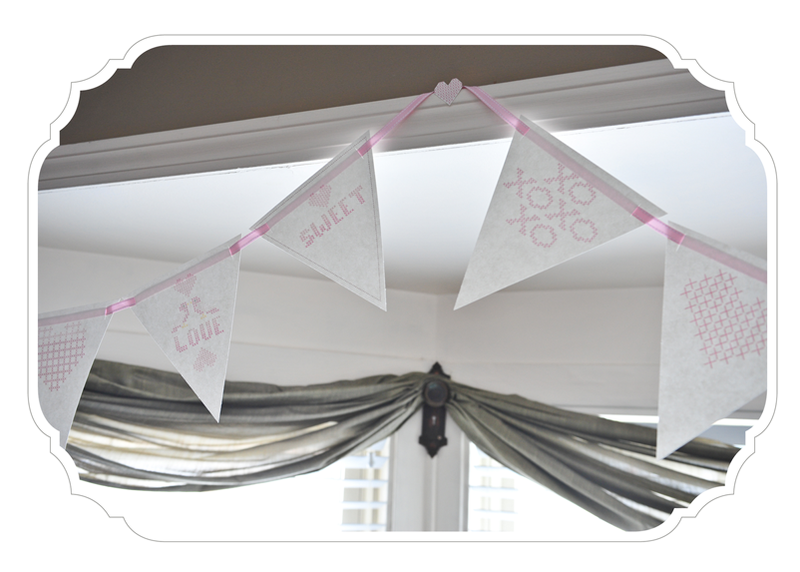 Around our house we love to make and put up bunting for different holidays. It is such a fun, whimsical and easy project to do with the kids…and it always looks great! In the past we have either found free downloads on the web for bunting designs, or followed a great tutorial, but this time I decided that I was going to create our own bunting…and then offer it as a download for anyone else! I was looking through a number of craft blogs yesterday and got inspired by some cross-stitch designs I saw. The light bulb clicked! I will make a valentine’s day bunting with a cross-stitch feel. So instead of grabbing my needle and thread, I opened up my trusty Adobe Illustrator and got to work. I was really happy with the results. We hung it up in our main living room window yesterday, and love it! It’s the day after Thanksgiving, and all things Christmas are now “allowed”. (smile) This card is a year old, but I didn’t have a blog to feature it then. I have been creating a Christmas card for the Alexander family for about three years now, and it is fun to watch their kids grow up from year to year. Usually we try to fit in a trip to Nashville so that I can photograph the kids, but that didn’t happen in 2009. So their mother took these photos and I designed the card. Another issue of TEAMHorizons is at the printer, hopefully about to be mailed out to all of the subscribers by Friday. It is always fun to see an issue come together, even though there is a level of frustration that accompanies each story. I am so blessed to get to photograph and design something that tells amazing stories! Back in May I traveled to the Czech Republic and Austria, and then at the beginning of August I was down in Mexico. I thought I would just share a preview of some of the spreads from this issue. If you would like to see the full digital issue, you can visit the TEAMHorizons media page. With many thanks to Luxecetera, rojo foto//design has a fantastic new look! When I started through this process with Luxecetera, I knew right off that this was going to go somewhere great. Each phone call got me so excited and pumped up about possibilities, ideas, uses for the new pieces, marketing, and on and on… Even before seeing the first round of concepts, I knew I had chosen the right design firm to help change the look of “rojo”. This has been quite a process for me. I had to fight back some guilty feelings for not working on this myself. But I knew that first, I don’t have a lot of time to spend developing a brand for myself, and second, I could never please myself. Maybe I’m just a rarity…but somehow I doubt that. So I really wanted to convey to Ashley and her team what I was about, what I love, what I get inspired by, and they listened very carefully and intently. One amazing moment of brilliance (because I think there were many) came when I got a phone call back from Ashley and she was telling me about the process of choosing the cricket to add to the branding. During our early conversations I talked about my background in music and how music is still a large part of my life, and so they wanted to add that into the brand in some way. To my relief they decided to not go the route of a bird sitting on a branch, but instead started to think of other “musical” things. When Ashley told me they had decided on a cricket, I knew that was going to be amazing! It is clever and unique, and I loved the subtlety of fitting this musical side of me into the branding. Patterns, illustrations, fonts, colors, paper type, stamps, sizes, and so many other details were thought out and executed so wonderfully! I could go on and on about Luxecetera! Seriously, if you are looking for branding…look no further. So, I am proud to be able to show you guys some of the stuff that Ashely at Luxecetera worked up! Now…just shoot me an email to inquire about your wedding or portraits and you can get some “rojo” goodness in the mail! Thank you to Ashley, Tyrie, Jo and the rest of the crew that I didn’t talk to at Luxecetera for such an awesome brand! © 2012 rojo foto // design|ProPhoto4 Blog by NetRivet, Inc.